August 7 is Black Women’s Equal Pay Day, which marks how far Black women had to work into 2018 to catch up with what white men earned in 2017 alone. On average, Black women are paid 38 percent less than white men and 21 percent less than white women. To raise awareness of the pay gap and its negative effect on Black women and families, LeanIn.Org is launching #38PercentCounts, the second of three public awareness efforts this year rooted in the idea that equal pay matters. New research conducted by Lean In and Survey Monkey in partnership with the National Urban League shows that there remains a striking lack of awareness around the pay gap Black women face. One in three Americans is not aware of the pay gap between Black women and white?men, and half of Americans are not aware of the gap between Black women and white women. With the help of adidas, Lyft, P&G, and Reebok?all leaders in the push for equality in the workplace?LeanIn.Org is asking consumers to think about the impact of getting 38 percent less as they make everyday purchases on August 7. At adidas and Reebok stores across the country, customers will see the messages of #38PercentCounts on everything from shopping bags to purchase receipts. Lyft is asking riders to imagine if their trip ended with 38 percent left to go after each ride on August 7?and P&G is sponsoring campaign videos that bring to life the impact of the pay gap on real women and their families. 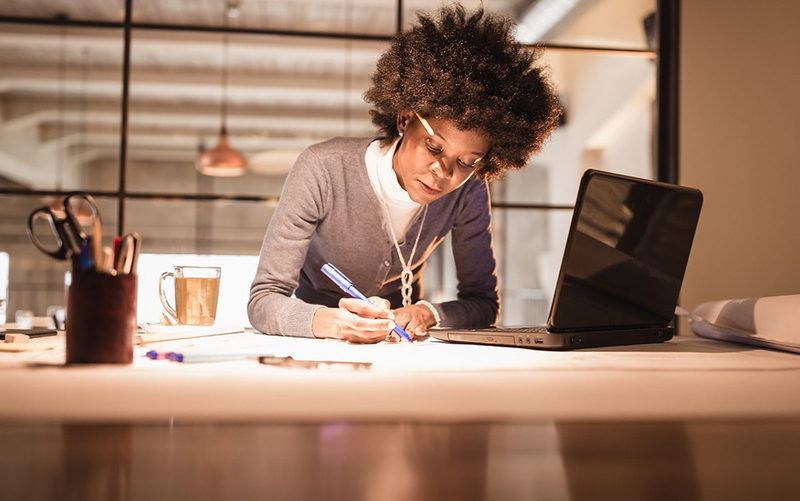 Salesforce, an equal pay pioneer, is providing the financial support for various Lean in Circle events around the country to bring awareness to the pay gap for Black women. For Black women, being paid less is just the tip of the iceberg. Compared to white women, Asian women and Latinas, Black women receive less support from managers and are promoted more slowly. These unique challenges faced by Black women?and women of color more broadly?are examined in LeanIn.Org & McKinsey & Company’s annual Women in the Workplace study. LeanIn.Org, SurveyMonkey, and the National Urban League’s recent survey findings also show that even when people know there’s a pay gap, it’s bigger than they realize. Forty percent of people who are aware of the pay gap Black women face underestimate its size. ?Moreover, the data show significant differences in how Black women see the workplace compared to everyone else. About half of white men think obstacles to advancement for Black women are gone but only 14 percent of Black women agree. Moreover, nearly 70 percent of people who are not Black think that racism, sexism or both are uncommon in their company?yet 64 percent of Black women say they’ve experienced discrimination at work. To further bring the impact of the pay gap to life, LeanIn.Org collaborated with Annabelle Hayford, the creator of the viral hashtag #DrawingWhileBlack, to illustrate a series of cartoons that highlight the unfairness of the pay gap for Black women. Additionally, LeanIn.Org is releasing a video Black women and their families?many from our Lean In Circles community?explaining what earning less means for them. When asked what 38 percent more would mean in their lives, one woman says she could retire comfortably, another says it would go toward her son’s education, and a family explains they could use the lost income to buy a house?or “two houses, actually,” says their son. On Lean In’s website, visitors will be able to show their support for #38PercentCounts, watch our campaign videos, and see the Black women’s pay gap “by the numbers.” In addition, business leaders and managers will learn what they can do to close the pay gap in their companies, and women will learn expert tips and tricks for negotiating more effectively. People are overly optimistic about the state of Black women. About half of white men think obstacles to advancement for Black women are gone, but only 14% of Black women agree. Moreover, nearly 70% of people who are not Black think that racism, sexism or both are uncommon in their company?yet 64% of Black women say they’ve experienced discrimination at work. The pay gap between Black and white women is even less understood. On average, Black women are paid 21% less than white women. Yet 50% of Americans?as well as 45% of hiring managers?think Black women and white women are paid equally. And 77% of working Americans think no gap exists between Black and white women in their own organizations.